Kind and gentle to your skin with balancing rose geranium, uplifting petigrain & bergamot, and the exquisite rose with rose petals. A great blend to combat anxiety, stress and hormonal fluctuations. 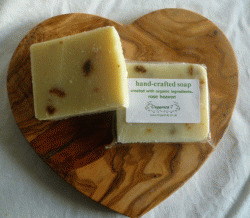 Organic Soap Gift One and Organic Soap Box Two - perfect for Birthdays, Christmas and any special occasion.